I had a good observation of this young male sparrow when I was sitting in the porch having some time out. I did not have anything in hands so I recorded him in my head. I thought surely I would remember him. Drawing from memory is one of "ancient" techniques, I believe, practiced by artists since stone age! After dinner I decided to give it a go, even after saying about stone age memory technique as above, I was not so sure. I did not practice ballpoint as often either. Here it goes. 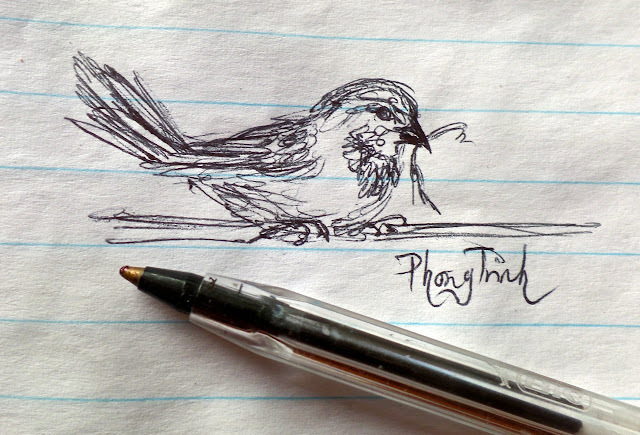 I think the drawing looks like the sparrow I saw. I am happy that I tried.